Cigarette Pack (Toughness: 4) - Slow and sinking, a cigarette pack is not hard to avoid. But it releases cigarettes which are fast and tricky. Fortunately, they're not fast on the climb. Like a toaster, a cigarette pack may sometimes release a cigarette through the ceiling. Near the third telephone booth, there is a narrow passage with a light switch. (Only a small-sized Esper can enter this passage.) The Secret Bonus is in the 3rd ? box (the one just before the Magic Jar) in that passage. Be careful not to hit it by mistake in the darkness. The Secret Bonus is in the 4th ? box to the right of the Magic Jar (not counting the one blocking the entrance to the Magic Jar). There are plenty of items around, so score adjustment should not be a problem, except that the cigarette packs attempt to disrupt you, and their toughness makes them poor targets for score adjustment if you have minimal attack power. Well, it's just there. Nothing but a ? box (containing a Smiley) blocks the way. If you haven't got Makoto or Bunta by now, you'l find him here. If you don't have Genzoh and you have got All Gold Bonus in scene 3, you'll get Genzoh. Otherwise, you'll get a Magical Bonus. If you're completing EXTRA with that ? box, be extra careful to wait a few seconds before picking up the Magical Bonus. 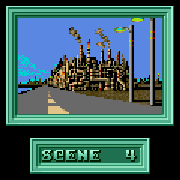 Scene 4 consists mostly of a few large areas, some with fire-lined floors, others with annoying enemies. All the fires in this scene are real. You start in a large room with a lamp above, and a couple of cigarette packs and lots of fires below. There is no reason to go below, since there's nothing of value there. Starting with Akiko is recommended, though some experts may use Naoki instead to save time. It's a large room, so the light bulbs are not too difficult to evade. In the telephone booth in the next room, you may either change to Naoki or keep using Akiko. Jump from one moving box to another, or hammer the ? box with the red jewel and jump onto the other ? boxes through it. After passing the ON gate, there is an area with 18 food pots in 3 groups, and a cigarette pack with lots of fires below. One key to clearing this room safely is the 'magic spot' to banish the cigarette pack: just stand on the upper-rightmost food pot for a few seconds. You may use the moving box, but you don't always have to; the floor spaces which are not covered by fires are as good footholds as the moving box. In the next room are the Magic Jar, the Secret Bonus, more food pots, and 2 cigarette packs. Your basic enemy-fighting skills are tested here. 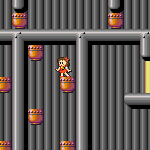 The safest way to get through the vertical room with the lamps and the moving boxes is to refine your jumps so that you clear this room swiftly. 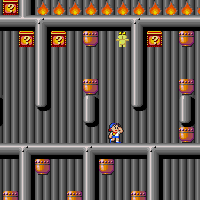 You can banish the lamps by making your first jump along the right edge, but one lamp will quickly appear again, and you can't banish it this time. In the next area, 2 packs of cigarette may appear; don't waste too much time fighting them. I've found that walking through the telephone booth instead of over it often prevents the enemies from appearing. In the vertical room, beware of the umbrella which tends to appear at the wrong moment, right on you. Needless to say, change into Bunta to force the heavy doors in the final area. Don't forget to return and change into whichever Esper you want to use for fighting Satan. This one is nasty. Two lamps and an umbrella in a small, confined area makes life hard, and cigarettes below make it dangerous for you to use the moving box. However, none of these is any match for Genzoh's mighty staff. He walks in, rides the moving box to the right side, jumps, and in 4 hits Satan is shattered to pieces. Without Genzoh, this becomes an entirely different story. Having the P power, or coming on a broom or with Stop helps somewhat, but should you lose those, you should be prepared to fight a long battle, during which dangerous light bulbs will be bouncing all around you. 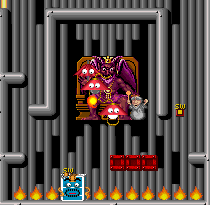 And taking Bunta instead of a kid is a real gamble: although he is good at destroying lamps (and Satan too) when he reaches them, Bunta's size forces him to take the right route around, and without good hovering, one trying to ride the moving box from the right is very vulnerable to fireballs. The best strategy for destroying scene 4 Satan safely is undoubtedly to get Genzoh in scene 3 or scene 4 and use him here. All the fires on the floor are real. If you fall below the moving box, the light switch is your only chance. Don't fall, in the first place. You start in a large, open room with 16 food pots. Looking at the food information, it is not hard to see that one should start by getting sets 3 and 4. Start with either kid, and hammer twice before opening a food pot. Feel free to deploy icons or get the blue jewel with these 2 hammerings, if you feel like being elegant. Get all 16 food pots. 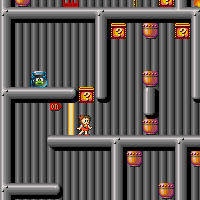 (A good player with Akiko can do this while skillfully evading the light bulbs, without any excess hammering.) Now you're at a break point where you can freely open ? boxes and hit lamps (if you've got the P power) and light bulbs, though you may count modulus 3 to avoid the hamburgers if you want. In the next area with 18 food pots, use the magic spot to get rid of the cigarette pack, and get the smallest sets you can manage to. (If you're getting sausages or hamburgers, hammer once after finishing the set.) In the next area (with the Magic Jar and the Secret Bonus), you will finish the next set, and now there's only one set left. Not difficult at all, if done correctly. This page was last edited on 13 December 2010, at 20:40.